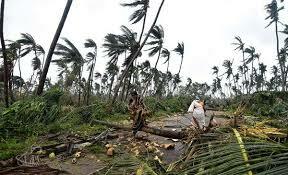 Why Vardah failed to wreak havoc? In December 2015, Chennai was taken by surprise with unabated rainfall submerging large parts of the city bringing it to a standstill. The catastrophe was due to excessive rainfall in the upstream rivers to the extent of 68 cm within 48 hours (as against an annual rainfall of 63 cm during the entire northeast monsoon in Kancheepuram District) and the problem was compounded due to encroachments in water courses, on river banks and constructions in ﬂood plains. However, some quarters opined that the preparedness could have been much more elaborate to face extreme weather events. A year later, in December 2016, the city was face-to-face with another extreme weather event, the tropical Cyclone Vardah. This time around, the government had put in place preparedness measures to deal with any freak rainfall, ﬂooding, cloudburst, drought or cyclonic storm incident well in advance. It saved the city when Vardah struck. Using the legacy data from past incidents, vulnerable areas were identiﬁed and classiﬁed as very highly vulnerable, highly vulnerable, moderately vulnerable and low vulnerable. Based on the vulnerability analysis, vulnerability maps were drawn for these areas complete with evacuation routes to relief centres. Teams comprising members from various stakeholder departments such as ﬁre services, rural development, agriculture, police were formed to monitor these vulnerable areas. The State Disaster Response Force (SDRF) was strengthened by training more than a 1,000 police personnel. A deployment plan for prepositioning of these teams and relief material for swift rescue and relief operations in case of a disaster was also drawn. Senior oﬃcers were appointed across districts to monitor preparedness measures and interdepartmental coordination. Besides these, massive exercises for desilting 22,899 tanks and 11,446 km of water bodies and clearing blockages on either side of at least 15,870 bridges and more than 1.4 lakh culverts for up to 500 metres upstream as well as downstream were undertaken. Not only were new recharge pits created but thousands of defunct borewells also converted as recharge pits. Community participation at the grass root was ensured by enrolling and training volunteers, skilled in swimming and climbing, by Fire Services, SDRF and Red Cross Society to act as ﬁrst responders in an emergency situation. More than 10,000 such volunteers were trained and formed into batches of 10 for highly vulnerable areas across the State. 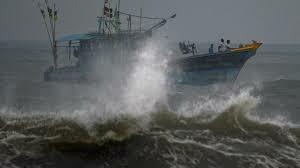 The Indian Meteorological Department (IMD) issued a warning about Vardah crossing Chennai on the afternoon of 12th December 2016 and aﬀecting Chennai, Tiruvallur and Kancheepuram districts just a day in advance. The administration, however, was on high alert from 8th December itself. Despite the paucity of time, advance preparedness measures enabled swift action by ﬁrst responders and inter-departmental teams towards evacuating thousands of persons from coastal as well as low-lying areas. Four teams of SDRF, six teams of National Disaster Response Force (NDRF) and 700 personnel from the Fire Department were positioned in vulnerable areas. While two columns of Army personnel were kept ready for deployment, Navy, Air Force and Coast Guards were also alerted. Similarly, government hospitals were supplied with an adequate stock of generators, oxygen cylinders, medicines and other supplies to respond to any emergency. Private hospitals were also alerted to keep emergency arrangements ready. Fishermen were advised to not venture out in the sea. Boats were kept ready for speedy rescue operations in case of ﬂooding. A holiday was declared for schools and colleges on 12th December to limit vehicular traﬃc and movement of people. 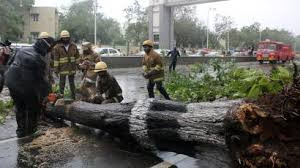 This played a signiﬁcant role in reducing the loss of lives during the cyclone and speedy clearing of uprooted trees or other damaged structure on roads thus restoring traﬃc the same night. This could be achieved by mobilising responders and conservancy staﬀ from districts not aﬀected by the cyclone to clear the roads and prevent stockpiling of garbage to prevent the outbreak of any disease, respectively. Health camps to check the spread of communicable diseases were also organised. A sustained Information campaign using multiple channels of communication making the vulnerable communities aware of the Do's and Don'ts of the event along with repetitive public advisories not only promoted community involvement but was also instrumental in minimising the loss of lives during the cyclone. Each disaster presents an opportunity to learn from it. The Tamil Nadu Government used the opportunity presented to it after the December 2015 deluge to internalise the importance of disaster preparedness. Preparedness that helped it save human lives, minimise losses and ensure that the aﬀected areas were back on its feet in a matter of a few days.